For some time there has been a shortage of advocates to meet the demand for assistance from the Defence and veteran communities in the Northern Territory. To address this, the NT Government and ex-service organisations have joined forces to offer a 12 month paid position for a Military Compensation Advocate Level 2 or above. The paid advocate will be supported by a close-knit team of volunteer compensation and welfare advocates based in Darwin. A motivated and diligent person will be able to make a real difference to lives of current and former Australian Defence Force members and their families across the Territory. The closing date is 6 April 2018. The above SOPs take effect from 2 April 2018. The above investigation notices appear in the Government Notices Gazette of 13 March 2018. The investigation concerning 'toxic maculopathy' has resulted in the determination of Statements of Principles concerning toxic retinopathy. The investigation concerning 'Baker's cyst' has resulted in the determination of Statements of Principles concerning popliteal cyst. As a result of becoming aware of a minor typographical error in each of the Statements of Principles concerning malignant neoplasm of the ovary determined at the December 2017 RMA meeting, the Authority determined to correct the Statements of Principles with the amendment above. The amendments to the Statements of Principles (SOPs) concerning suicide and attempted suicide explicitly identify separation from the Australian Defence Force (ADF) as a ‘circumstance of service’ which could link the development of category 2 psychosocial stressors, which might manifest years after separation, with subsequent suicide or attempted suicide. The sound medical-scientific evidence available to the Authority established a clear link between separation, the onset of these stressors and suicide and attempted suicide. To give these links explicit recognition in the Statements of Principles, an additional note (Note 1) has been inserted after subsection 9(11) in the Reasonable Hypothesis SOP and subsection 9(8) in the Balance of Probabilities SOP. The additional note also serves the purpose of bringing to the attention of ex-serving Defence Force members, their dependants and their representatives, and decision-makers, that category 2 psychosocial stressors may manifest years after separation from service and that these stressors may be related to the circumstance of separation. The Authority also reviewed and updated its Information Publication Scheme Agency Plan. The Regional Implementation Group Region 2 is responsible for supporting the implementation of the ATDP in New South Wales, the ACT and Western Australia. • Please send your application to~~ ATDP.Communications@dva.gov.au ~~ by 2400 AEDT on Friday, 13 April 2018. VETERANS and their families will receive increased support services and income support payments after the Senate passed new legislation today. The legislation follows a $31 million boost to mental health services which was announced late last year. Minister for Veterans' Affairs Darren Chester said the legislation was part of the Turnbull Government's ongoing commitment to improve services for veterans and their families and delivers a significant part of the Government’s response to the concerns raised in the Senate Foreign Affairs, Defence and Trade Reference’s committee report. "We are constantly striving to deliver the support and services needed for those who have served our nation," Mr Chester said. “This is a great outcome for veterans and their families who play such an essential role in a veteran’s health and wellbeing with additional services to be provided under these new measures which include increased access to childcare assistance, home care and counselling. “We have also established a new income support payment for veterans with mental health problems who are unable to work so they have a source of income. This will reduce the stress this places on both the veteran and their family in what can be a difficult time. Mr Chester said from 1 May 2018 a new pilot program, the Coordinated Veteran Care mental health pilot will commence which aims to support to veterans in rural and regional areas with chronic mental health at the mild to chronic status combined with co-morbid health conditions. “Veterans are at the heart of many communities around Australia and it is essential they have access to these services no matter where they live and this a great initiative to ensure vital mental health services are delivered,” Mr Chester said. Mr Chester said the qualifying service determination has also been simplified by automating the process which will remove the requirement for veterans to make an application for the determination. Other measures in the legislation include an entitlement to a Gold Card for Australian Defence Force members who served in Japan after the cessation of hostilities at the end of World War II and before the British Commonwealth Occupation Force commenced. Separate to this legislation, Mr Chester said anyone who has served one day in the Australian Defence Force can have mental health treatment free for any mental health condition. VETERAN pension payments will increase in March in line with the biannual indexation process. Pension recipients including veterans, their partners, war widows and widowers across Australia will receive increased payments from 20 March 2018. Due to the calculation of pension rates on a daily basis, the first pension paid after the indexation on payday 29 March 2018 will comprise both the old and new rates. The new pension rates will be fully effective from payment date 12 April 2018. Pensions are indexed twice a year in March and September. For a full list of pension rates, please visit www.dva.gov.au or call 1800 555 254. 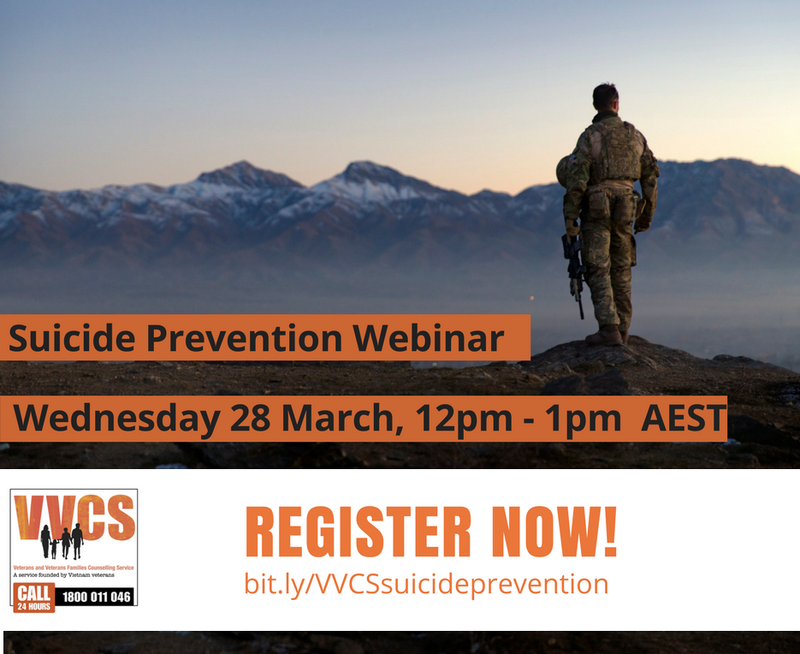 Join VVCS for their next community webinar on suicide prevention where they will explore its importance in our community and provide advice and resources to support you to assist your friends, family and colleagues experiencing challenging personal times. APPLICATIONS are now open for the Building Excellence in Support and Training (BEST) grants and Grants-in-Aid for ex-service organisations announced by Minister for Veterans’ Affairs Darren Chester today. “These grants help ex-service organisations provide vital advocacy services for current and former serving men and women which help veterans with their compensation claims and also ensure they get correct access to entitlements and services,” Mr Chester said. “More than $4 million in over 155 grants has been provided to ex-service organisations supporting veterans under these programs in 2017-18 and I encourage all ex-service organisations apply for this round of grant funding. “Applications for both grant programs close on Thursday 19 April 2018 with payments to the successful applicants to be made before the end of 2018-19 financial year. “Organisations needing assistance with online lodgement are encouraged to seek help through the Community Grants Hub. Support is available by phone: 1800 020 283 or by email: support@communitygrants.gov.au. To receive an email alert when veteran and other community grants are open for applications on the Hub, visit www.communitygrants.gov.au.